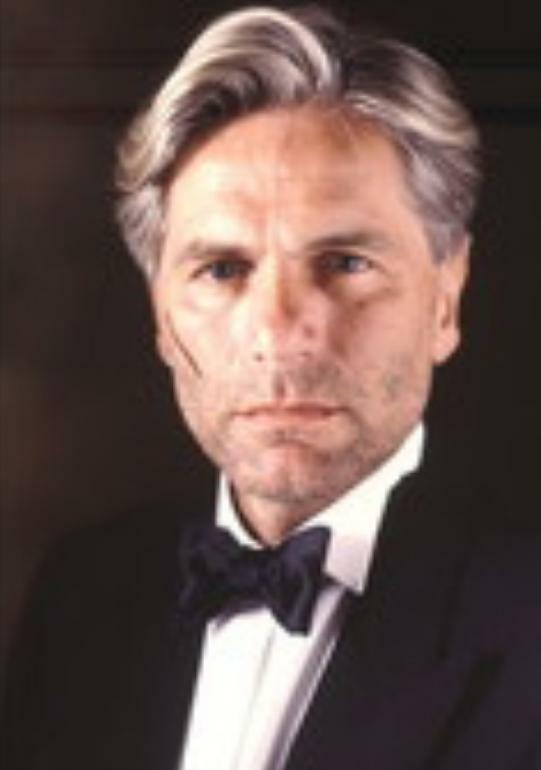 Publicity shot from Adam Faith - fair play, despite the comedic elements of the film, he was quite a nasty villain in this. Its funny, I've not watched this special very much over the years, but I enjoyed giving it an airing last night as part of my trawl through the Terry years. Is it just me though or is the incidental music dreadful? Following on from my previous comments in the Waiting for Goddard thread, with the recasting of actors/actresses as different characters in other Minder episodes, I've found 12 in this special! A bowl of Virgin Trains leek and potato soup has just ignited a happy memory of Minder on the Orient Express. Shortly after Arthur and Terry board the train they are seen perusing the menu. Terry says he'll have the "loop the loop" to start. Arthur says something like "there's no soup on the menu". Terry replies "Yes there is. Potage (pronounced in a very English way). Its French for soup"
Don't know why but it just came back to me and made me smile. Really good. Watched the other week. I thought there was just the right amount of farce (maybe a little too much?) and skullduggery. The cast were all good I thought, particularly the bad guys. It would have been nice to do a couple more 'movie length' specials, I reckon. Might have got the show to the US. Was MotOE ever shown over there? I think they dropped the ball a bit with Officer.. Which was a shame. Not as bad as some make out but not as good as Orient by some way. I really got officer and could see what they were trying to do but it just wasn't so good. I doubt that Minder On The Orient Express was ever shown in the US since the series wasn't. If it was shown it would have been as part of a package of films not just on its own. Wonder why the US never took it on. It got millions of viewers over here. I'm pretty sure I mentioned this somewhere previously. The English that Arthur and Terry speak would sound like a foreign language to most Americans. It would be gibberish to mainstream American viewers. The slang would also be another factor. The best chance Minder would have had in the US would have been for an American version using the format. It probley would have had a different title since the term Minder isn't known here. Trust me, an America version of Minder would have been a total disaster. Actually now you say all that I suppose The Bodyguard with Kevin Costner probably didn't do it that much justice.. I notice one of the UK DVD releases from Clearvision has a 'Famous Faces' quiz contained on the DVD. Not entirely sure if this was a very poor attempt to get people to invest or not. Has anyone played this Clearvision 'extra'? This thread has reminded me of how much fun this episode is. I started watching Minder again from the first episode but may jump ahead to watch this again. 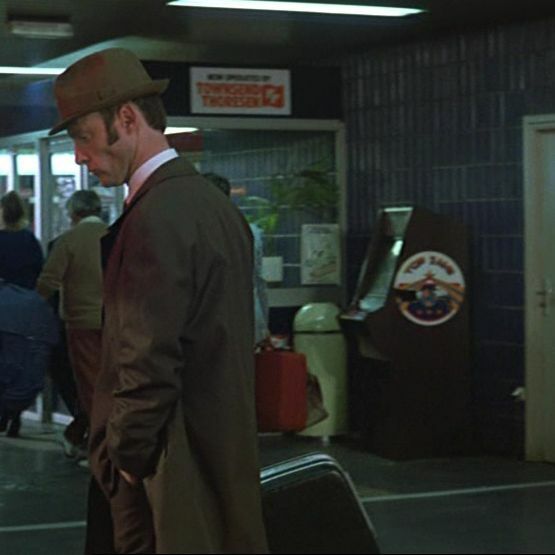 I noticed ubiquitous extra Don McClean pushing a bag trolley at the station when Arthur arrives there. 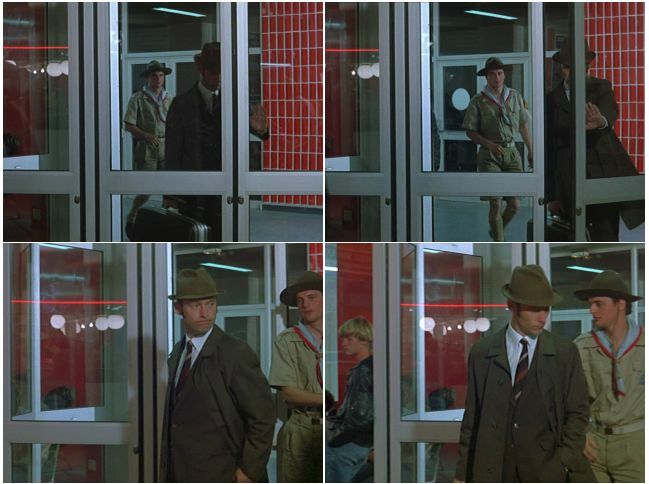 Also, when they arrive in Boulogne, when Chisholm enters the arrivals zone to meet François LeBlanc, the scout leader that enters directly after him looks a lot like Andrew Paul aka Dave Quinnan off 'The Bill'. Pretty sure it's him. 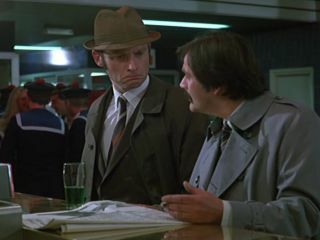 Also, when they arrive in Boulogne, when Chisholm enters the arrivals zone to meet François LeBlanc, the scout leader that enters directly after him looks a lot like Andrew Paul aka Dave Quinnan off 'The Bill'. Pretty sure it's him. Would they have taken 'extras' over to France rather than hire-on once there. And in the same scene, what exactly is the arcade game there behind Chisholm? Top something? As I've got closer, I've been looking forward to seeing this again. Too many great scenes in it to mention and the superb guest cast, with Maurice Denham's Meredith Gascoyne being one of my favourites, not to mention the lovely Debbie Arnold. The big fight scene on the Orient Express before Terry, Arthur and Nicky leave is possibly a bit too close to farce but that doesn't spoil it. Can't think of many greater TV shows for Christmas night than this. Surely it deserves an outing on TV occasionally. 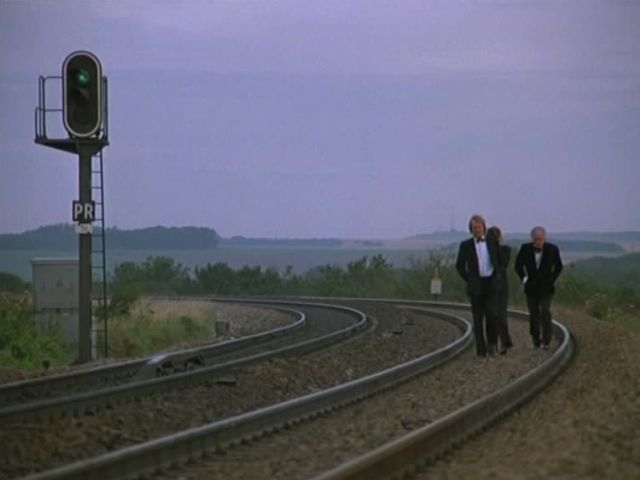 Minder on The Orient Express tip of the day: never loiter on the Eurostar main line looking for location shots in the interests of fandom. It is a real shame this doesn't deserve a airing on TV. They air quite a lot of other Christmas specials from other comedy dramas. So why not Minder On The Orient Express? I watched this for the second time tonight. So many great moments and lines! Arthur on the park bench is a highlight and hearing him say "Interplod" makes me laugh. "Interplod" and Goodbye Sailor's "River Filth" should both be in the Oxford English dictionary. Quite possibly but am I the only one who thinks this aspect was totally extraneous. There's plenty going on without Arthur being wrongfully fingered for a Mafia hit which has naff all to do with the rest of the film. Otherwise a fun feature lenghth episode that starts a bit like an alternative reality version of All Mod Cons where Terry took the job in the posh club then turns into a comedy replay of The Sweeney episode "Sweet Smell of Succession". Plus you've got Garfield Morgan as the Super - you could almost believe Fulham Broadway was where Frank got sent to recover after all the trouble in "Victims". Is it Mr Povey sitting at the piano at 1hr 29m 28s? Also I think it's been said before, he might be the delivery drivers' mate in the first half an hour of the film? No and no. I explicitly asked Meic about the rumours and questions of him appearing in other roles in this and/or as an extra in the café in series 1's 'The Bengal Tiger' as there's an extra in that who is the spitting image of him. The answer is always 100% 'no, it wasn't me', just people who look a bit like him. I agree ltd, the Arthur as doppelgänger story was probably unnecessary - it adds very little to the film for me, other than perhaps 'a pinch of espionage-ganger-style' giving it a reason to include more foreign wrong'uns on the train journey. In terms of the overall Jack South story, it adds nothing. Thanks for clearing that one up jno. Wow! I never realised that MOTOE was supposed to be the final instalment of the series!!! So how and when did they decide to do another? If you watch the 'Sunday Sunday' interview with Dennis Waterman on the minder.org YouTube channel apparently it was an offer neither he or GC could turn down. Ahh, the big bucks will do that! Worth the special of Series 6 I think. 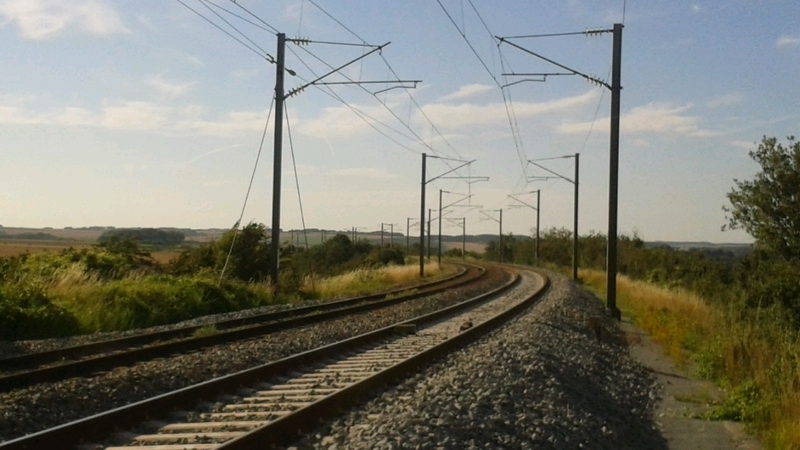 Minder of the Orient Express as a way to take away from London is a nice escape of the year.